A dressed up local version of your typical standard meatloaf. This recipe served with a sweet, tangy and spiced teri sauce. 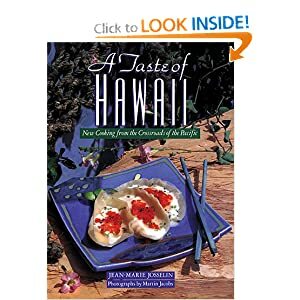 Order A Taste of Hawaii Cookbook - This book features Hawaiian food that is based on fresh ingredients combined with indigenous seafood and tropical produce. The photos, shot on location, are as delicious as the recipes. Preheat oven to 350 degrees. In a mixing bowl; combine ground beef with remaining ingredients. Transfer into loaf pan. Bake 1 hour. In a saucepan over medium high heat; combine sauce ingredients. Simmer 10 minutes. For service; drizzle sauce over slices of meatloaf. Garnish with green onion. Serves 6-8.